That’s a quote from Apple’s announcement yesterday about how excited they were with customers’ reaction to the launch of the iPhone 5 following a mixed reaction from the media (something we analysed with our new Lissted application last week). 2m in 24 hours sounds very impressive, and it is in absolute terms. But all things are relative and when you put this number in context it loses its shine a little. To do this we need some data and a couple of assumptions. The table at the bottom of this post shows quarterly sales volumes of iPhones since the product was launched. These have been extracted from Apple’s quarterly results from Q/E 30/6/2007 – Q/E 30/6/2012 (hat-tip to @latestgadgetsuk for pointing me in the right direction). These show that total iPhone sales in this 5 year period have been 244.16m. 1. That on average iPhone owners upgrade their phones every 18 months. In reality it will probably be a mix of die hards changing every new model and less ardent fans perhaps changing every two models, with some in-between. 2. 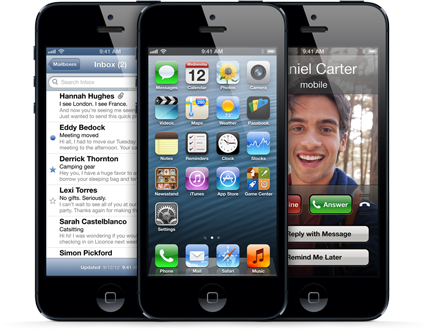 That it is only existing iPhone owners who have pre-ordered the iPhone 5. This won’t be the case, there’s bound to be some new converts in there, but if so this would only make my conclusion stronger. On this basis then on average people who bought their iPhone 18 months ago would be looking to upgrade about now. Looking at the table below that means the Q/E 26/3/2011. Apple sold 18.65m phones in this quarter. That’s approx. 200,000 per day. Given Apple effectively announced the iPhone 5 on the 4th September by their invite I seriously doubt many people went out and upgraded their iPhone 4 to a 4S in this period. In which case by the time pre orders opened on 14th September there would be (on average) 10 days of pent up demand for upgrades. 10 days @ 200,000 per day = 2m. In other words the number of pre orders is equal to the number of upgrades you would have expected given the number of iPhone owners, likely upgrade cycle and the 10 day fallow sales period that the invite probably caused. And what about the comparison to the iPhone 4S previous record of 1m that it “shattered”. In this case we need to look at the Q/E 27/3/2010 to find the likely upgraders. Apple sold 8.75m phones in that quarter. That’s approx. 100,000 per day. Invites to the launch went out on the 27th September 2011 and pre orders started on 7th October 2011 – 10 days again. 10 x 100,000 is……you guessed it 1m. So the level and growth in pre orders arguably represents nothing more than existing customers upgrading at expected levels and the growth in the iPhone ownership base since the 4S was launched. So watch out whenever the iPhone 6 comes out. If Apple wants to “shatter” the pre-order record again you might just see those invites going out a week earlier!